A bendable, flexible phone holder with a Bluetooth camera shutter remote lets you take photos and selfies from distances and angles that would otherwise be impossible. Wrap it around a pole, hang it from a branch, attach it to a fence, or sit it up on a tabletop and never leave anyone out of the picture again. Folds down compactly making it perfect for travel. Dimensions: 19" x 1.5" x 0.5"
I bought this for my sister-in-law and she loves it. My sister-in-law says that she loves it. This worked well for us, so glad we purchased it. This flexible phone holder is the hands-free way to get pictures you didn’t think were possible. 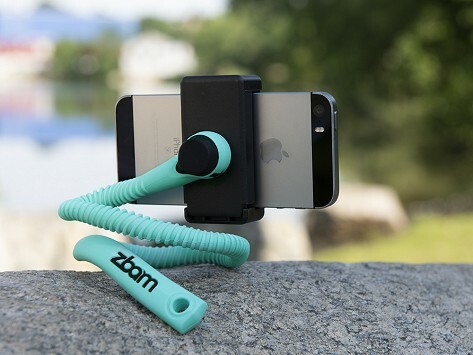 Just attach your phone and wrap the mount around a tree, a pole, a fence, or anywhere else you need. You can even set it up like a tripod. The Bluetooth camera shutter remote lets you take photos from up to 30 feet away—way longer than your arm’s reach. This also lets you use your phone’s back camera, which usually takes much better quality pictures than the front. Now you can get the perfect shot wherever you are—without leaving anyone out. You can even use it to hold a small camera. The mount is super bendy and folds down to a perfectly packable size, so it’s great for family or solo travel.